Reconciliation Ministry is now accepting new grant proposals for Pro-Reconciliation and Anti-Racism projects for 2019. Grant proposals from disciples general ministries, Regional ministries, Disciples higher education ministries and recognized ministries of the Church are due by January 31, 2019. The guidelines for proposals can be accessed by clicking here. The fillable Proposal application can be accessed by clicking here. The Preliminary Grant Report to be sent by Sept. 15th can be accessed by clicking here. In October of 1967, members of the Christian Church gathered in St. Louis, Missouri at the annual International Convention of Christian Churches where a group of those members brought up the distress urban areas across the country were experiencing regarding w issues of racism and poverty. Participants at the Convention felt strongly that the church should make intentional effort to address these issues happening throughout the church and nation. So, they got to work. Almost immediately the United Christian Missionary Society through the Urban Emergency Action committee received funds to begin providing grants to social services organizations who were already serving communities in the work the church was looking to support. Organizations like the Boys and Girls Club and the YMCA received grant money to aid in their efforts dismantling societal oppression. After a year of success and increasing interest from across the Church, General Minister and President, A. Dale Fiers, convened a steering committee to discuss and strategize how to further address the racial and social oppression that was occurring in American cities. The committee had a goal of raising $1 million over two years for programs in urban centers and rural communities..
What the church thought would be a temporary fund that would eventually lose interest became a movement. Reconciliation: The Urban Emergency Program consistently met its fundraising goals, with congregations within the denomination generously donating money, overwhelmingly supportive of a mission working within the the vain of social justice during the tumultuous civil rights era. In 1971, the Church now officially organized into the Christian Church (Disciples of Christ) formalized its commitment and call to the work of Reconciliation as a permanent ministry within the denomination. The call to Reconciliation: The Urban Emergency Program – the Reconciliation Ministry continues its witness these 47 years later. Today, the ministry works to break down systems of oppression that effectively marginalizes people through practices of social and economic exclusion. Reconciliation Ministry offers anti-racism and anti-oppression trainings throughout the Church to foster a denomination-wide understanding of the importance of dismantling systemic racism and poverty in their community where they serve and do mission. Reconciliation Ministry still participates in funding community organizing networks and church-wide ministries through it granting program and robust anti-racism educational efforts. During the last week of September and the first week of October, the Reconciliation Ministry Special Offering is received in congregations; individuals and congregations can donate in their congregations, through online giving, or by mailing a check payable to Reconciliation Ministry (P.O. Box 1986, Indianapolis, IN 46206). On September 30th and October 7th, congregations all across the United States and Canada will collect the special offering for Reconciliation Ministry. As a way to prepare for the offering, and in partnership with the National Benevolent Association, Refugee & Immigration Ministries, and Disciples Immigration Legal Counsel, Reconciliation Ministry is offering a couple of educational webinars for all Disciples. The webinars are free of cost, but require registration in order to obtain access. Language is used to dehumanization and control the image and narratives of black and brown people and provide a vehicle for their criminalization and imprisonment in this country. In this webinar, we want to address the reality that how we think/talk about certain people in this country is counter to what it means to be created in the image of God, and people of faith have a role in dismantling these images that fuel and support an unjust criminal system. This webinar is presented in partnership with Reconciliation Ministries of the Christian Church (Disciples of Christ). As we follow the church calendar, we order our time according to the life events of Jesus Christ. This calendar includes two great festival seasons, Christmas and Easter. Each year begins with Advent, the time of preparation when we look to the coming of Emmanuel, God with us. In doing so, we stand on a continuum of past, present, and future as we are reminded that we live in the gap between what God has accomplished, is accomplishing, and will accomplish. This four weeks leading up to the twelve days of Christmas provides us a space to consider the reality of our world in light of the meaning of what it meant, what it means, and what it will mean for Emmanuel to come into our lives and into the world. When we pause to reflect on this, we must acknowledge what is incongruent between our current reality and life as revealed in the life, death, and resurrection of Jesus Christ. The sin of racism is one of the incongruencies. The good news is Advent does not leave us in a place of despair and hopelessness. It is the time of preparation and of looking forward with hope. During Advent we are not only preparing for the birth of a baby, albeit a special baby. We are preparing for the celebration of Emmanuel. Advent is the time to prepare, to celebrate, to hope that God is with us – today, tomorrow and forevermore. It is the time to anticipate with hope and joy the coming of Jesus Christ who reconciles humanity and all of creation with the God. This reconciliation includes the dismantling and end of the sin of racism. Scripture on 1 Corinthians 12:20-26 says, “As it is, there are many members, yet one body. The eye cannot say to the hand, “I have no need of you,” nor again the head to the feet, “I have no need of you.” On the contrary, the members of the body that seem to be weaker are indispensable, and those members of the body that we think less honorable we clothe with greater honor, and our less respectable members are treated with greater respect; whereas our more respectable members do not need this. But God has so arranged the body, giving the greater honor to the inferior member, that there may be no dissension within the body, but the members may have the same care for one another. If one member suffers, all suffer together with it; if one member is honored, all rejoice together with it.” Continue reading. 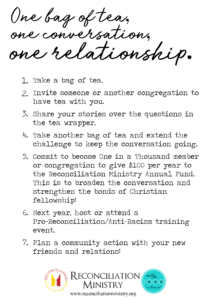 During General Assembly (2017), Reconciliation Ministry launched a new initiative, “One Bag of Tea, One Conversation, One Relationship.” This campaign is founded in the principle of “Oneness in Christ”. In our endeavor to work for racial and social justice and to ensure radical welcome for all, we can only accomplish this if we know each other better. We invite you to join the movement towards wholeness and embark on the journey of breaking down the walls that separate us by strengthening the bonds that make us one. 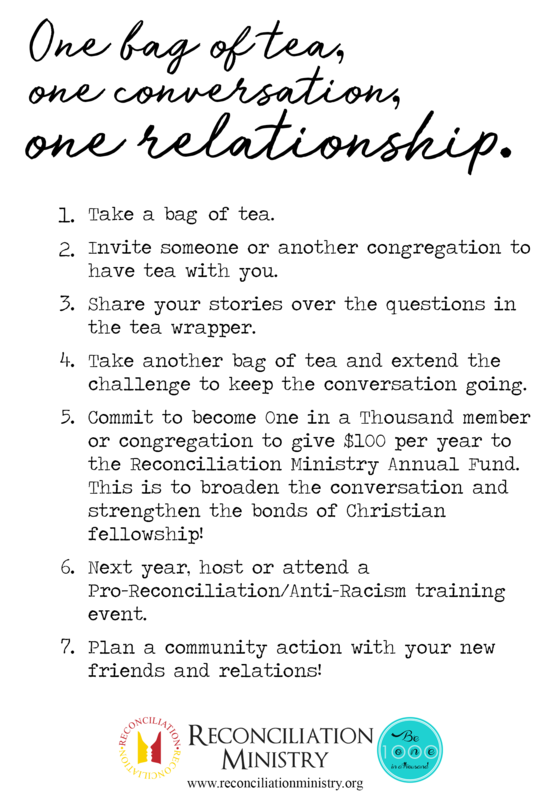 The idea is simple: 1) invite someone or a group to share a cup of tea with, preferable someone you would like to know more about. For example, you can choose someone or a congregation that is different from you such as in gender, age, race, etc., pick a date and location and follow the steps in the script to the right. Our office has special packets of tea with the script and wrappers with specific questions, each packet has a cost of $15 (shipping included) and it comes with 20 tea bags. If you are interested in doing this in your congregation or want more information about it, feel free to contact us! 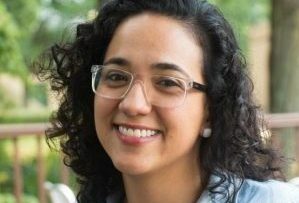 The Christian Church (Disciples of Christ) in Indiana and Reconciliation Ministry of the General Church welcomes Minister Bere Gil Soto to our staff as Reconciliation Program Minister. This collaborative staffing agreement between the General and Regional expression of the Church emerged out of a recognition of renewed conversations about issues of systemic racism and its local and national implications. As we seek to jointly address resourcing congregations and leaders for contextual and effective mission, we are very grateful for the gifts, graces and passions for reconciliation that Minister Gil Soto brings to this call of the Church. Born and raised in Central Mexico, in the beautiful town of San Luis Potosí, she obtained her Bachelor’s degree in Psychology from Universidad Autónoma de San Luis Potosí. Since early in her life, Bere has been passionate about social justice issues, learning from her mother who worked hard and relentlessly to demand equal rights for people with disabilities. As a lifelong member of the Christian Church (Disciples of Christ), she was involved in many roles of the Church in Mexico; from choir member, Sunday school teacher, VBS Director, worship leader and youth minister in the local church, to Secretary of National Board of Youth Ministries, as well as Moderator of the National Assembly. 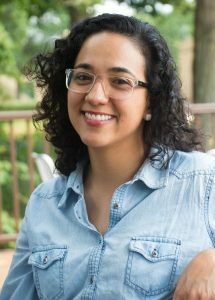 Bere came to Indianapolis in 2012 to pursue a dual degree at Christian Theological Seminary, graduating in December 2016 with a Master of Divinity and a Master of Arts in Marriage & Family Therapy. She has served the Church in numerous capacities including as a member of the planning team for the 175th Indiana Regional Assembly, and served her Field Education as student Pastor at Casa del Alfarero, as well as Reconciliation Ministry Student Intern. “My passion resides in people’s stories and the beauty and power that come out of them. At the end of it all, we are all part of God’s creative story!” She currently serves as Minister of Worship for Iglesia Hermandad Cristiana (Discípulos de Cristo) in Indianapolis. In her new role, Bere will complete the implementation of the Region’s RECONciliation Tour project, coordinate and direct reconciliation educational programming for both expressions of the Church with specific focus on regional camp and conference and clergy anti-racism education program. In her role with General Reconciliation she will manage communications and the congregation-based community organizing (CBCO) network database. This position is co-located in both the Indiana Regional Office and the Disciples Center where Bere will be accompanied by supportive colleagues who share in the Church’s commitment to our identity as a Pro-Reconciling and Anti-Racist Church – faithful, growing and serving our members with a passion for justice. Please join us in welcoming Minister Bere Gil Soto to this new call and collaborative ministry.